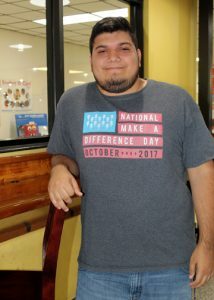 (HARLINGEN) – Eduardo Perez is a Computer Maintenance Technology student at Texas State Technical College. The 23-year-old expects to earn his associate degree next Fall Semester 2019 and holds a 3.6 grade-point average. The Los Fresnos native also serves as the vice president of his program’s Computer Tech Club and does community service work such as beach clean ups, beautification projects and serves at the Ronald McDonald House. After I graduate I plan on getting a second associate degree in Computer Networking and moving to Houston to begin my career and continue my education until I receive a master’s degree in computer science. My dream job is to work with a Los Angeles-based company building computers and medical supplies. I know I’ll eventually make it to the West Coast. My greatest accomplishment while at TSTC has been maintaining high grades and getting on the dean’s list and president’s list and organizing fundraisers with the Computer Tech Club to help other students raise money for additional certifications. The greatest lesson I have learned is that no matter what, you have to continue forward. I was stuck for a long time, working menial jobs before I enrolled at TSTC. Now I feel like I’m finally moving forward again. Who at TSTC has influence your success the most? My classmates at TSTC have had the biggest influence on my success. We help each other out and support each other. There’s always teamwork. It would be really hard getting through this program without them. My advice for future TSTC students is to focus on school, don’t allow anything to distract you from your goal and don’t quit.